On Sunday Sean and I were wrapping up our coverage of the very enjoyable New Hampshire Film Festival, which means we were, you know, in New Hampshire. Which is about 700km and a border crossing away from home. But we had something we were anxious to cover back in Ottawa later that same day, so we drove non-stop (and when I say non-stop, I may or may not be glossing over a stop in Vermont at the Ben & Jerry’s factory) and made it to Ottawa’s Mayfair theatre with mere minutes to spare to see the anthology of horror films presented by Andrew JD Robinson and Vincent Valentino. 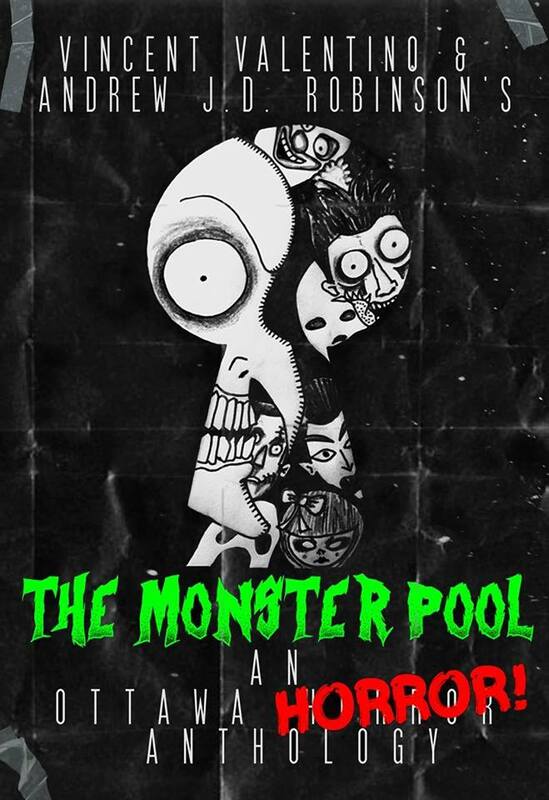 Monster Pool rules: your 6-minutes max film must contain 1. a cursed skeleton key that “causes” the horror and 2. a randomly assigned monster or horror film trope – like zombies, or a cabin in the woods. Robinson & Valentino had an exhaustive job ahead of themselves, soliciting entries and cobbling the whole thing together into a 2 hour marathon of local talent, and they premiered the thing to a packed house and enthusiastic crowd. The Mayfair atmosphere was pierced with screams and roared with laughter. The great outcome: it was a non-competitive showcase, and it was obvious that everyone had a great time just supporting each other. Unfortunately, there being 20 films on hand, I don’t have the space to review them all, so instead I’ll offer my heartfelt congratulations to all the filmmakers, and I’ll focus on just a few of the highlights. First, I’d be remiss if I didn’t tell you about an 11-year-old director and movie star called Daniel Elston. He recruited friends and family for his impressive entry, which featured droves of zombie pigs and lots of kung-fu and fart noises. Any of you who were once little boys are probably groaning with envy right now. He was the only kid entrant, and I found it very moving to think about how hard he, and his family (and I’m thinking his mom) must have worked to put this piece together. What a wonderful thing to receive this kind of encouragement at a young age. Pseudocoma, directed by Adrian Matthews & G. John Leslie, is about a girl who finds a strange key in a time capsule at her high school reunion, and then goes home craving blood (and worse), to majorly creep out her roommate, and me. I was particularly drawn to the excellent score, which I see is credited to Marcus Fong. Pandora’s Box, by Vincent Valentino, about a victim getting her revenge, was maybe the blood-lustiest showing of the night. It had awesome effects, blood galore, and is it just me or did I see some vertebrae? Gifted, directed by James Campbell & Nick Wilson, is about a wife’s birthday gift to her husband of an antique robot to add to his odd collection. But when his daughter uses a mysterious key to fix it up, the robot turns hostile. In this one I noticed the impressively gruesome sound design (Allen Roulston’s doing, I presume?). Vlog #79 was an undeniable crowd-pleaser with a strong, punchy script that accomplished a lot in under 6 minutes. With Luke Gabriel at the helm, it confidently blended horror and comedy and maximized its effect. A charismatic Youtube star has a life-changing experience in the woods one day, and the effects are…other-worldly? It’s actually really exciting to see so much local talent congregating together. One film, Engineers, by Tyler Williams, had great use of lighting and set design. One Small Step for Man, One Giant LEPUS for Mankind by Andrew Robinson was a fan-favourite work of mixed media shock & appall, while also garnering laughs between buckets of blood. The Golden Dawn had an excellent script. Marcello Varanda’s Room 666, was the sole animated contribution and managed to achieve quite a bit considering the constraints. Allen Roulston’s Very Bad Dreams had some really cool camera work, while Patrick Murray’s Scapegoat was visually stunning. Not a bad film in the bunch. Thanks for having me along, and I can’t wait to see what you come up with next. This entry was posted in Jay and tagged entertainment, horror movies, Ottawa on October 24, 2015 by Jay. I have had a ton of fun in our festival season, which we are now almost two months into. It’s flown by and we’ve seen some really great stuff. It makes me realize how much great cinema one misses if the only movie house in town is a multiplex. I must start looking at the Mayfair schedule again. I was a real regular before they switched owners, and had more nerdy double bills. This sounds like it was a fun event with some exciting creativity on display. Yeah, you can’t count em out. Well that’s a double bill, isn’t it? We should have made a date to all go together! These shorts were really well done. I liked the recurring key theme as well as the cryptkeeper interludes. They really helped tie these together and gave the whole thing a feature-film feel. Yes that’s right, even the credits and the interludes were well-crafted – it really gave a legitimate feel to the whole thing.